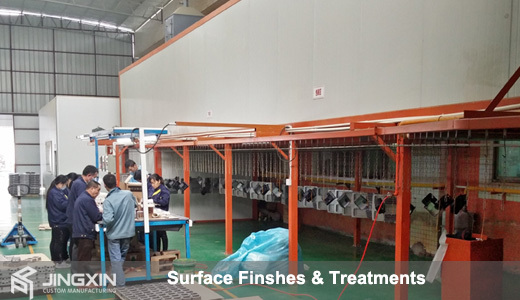 Finishing & surface treatment can be used for protection, decoration, and other uses. For example to your custom machining services parts, you may want to make electroplating or other post-treatment on your custom machined parts to protect it from oxidizing or mechanically brush the surface of the part to create a textured look. At JINGXIN® precision machinery Ltd., offers Various post-treatments & surface finish such as oil painting, powder coating, soft touch painting, Teflon & PVC coating, electroplating, aluminum anodizing, silk screen printing, laser engraving, Hardness treatment, wiredrawing, etc..or up to customer requirements. C) Sandblasting(including glass bead blasting, corundum-sand blasting, and quartz-sand blasting), polishing and anodizing for Aluminum parts.